A group of Boston Latin School students. Boston school officials are exploring the potentially dicey question of whether to change the admission requirements for the city’s three exam schools in an effort to boost enrollment of black and Latino students. An advisory committee formed to look at the admissions could usher in the biggest changes to the entry requirements since a federal court ruling prompted the school system to stop using race as an admissions factor more than 15 years ago. The exploration is a direct result of several allegations of racial discrimination at the city’s top exam school, Boston Latin School, where some students said administrators responded inadequately to complaints about racially charged behavior at the school. 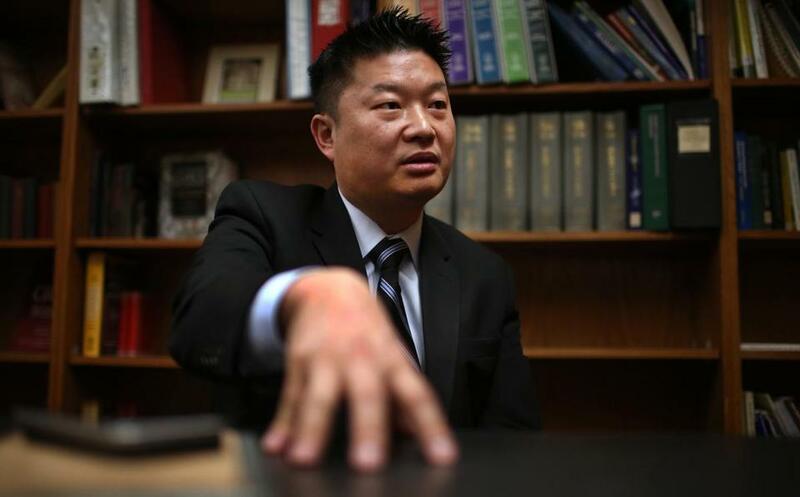 Superintendent Tommy Chang said the goal of the advisory panel is to ensure that all students have a fair shot at attending Boston Latin, Boston Latin Academy, and O’Bryant School of Math and Science. “The current admissions policy focuses on GPAs and test results, and the group is looking at that,” Chang said in an interview Thursday. Mayor Martin J. Walsh, however, immediately distanced himself from the idea, saying Friday night that it was premature to look at making any changes to admissions requirements. Walsh said he learned of the advisory panel by reading a story about it published Friday night on BostonGlobe.com. He said the school system should be focusing on creating more opportunities for students of color to take rigorous course work. He pointed to this year’s city budget that allocates more money for advanced work classes and his effort to add 300 seats to the exam school initiative, which is a summer program. One idea being urged by civil rights leaders to enhance diversity is to guarantee admission from top performers from each school in the city. Currently, along with having stellar grades, students must pass a rigorous entrance exam to gain admittance to the competitive public schools, as early as seventh grade. Schools across the United States are barred from overtly using race as a determining factor in admission decisions. But a series of Supreme Court rulings and guidance documents from the federal government in recent years have provided a road map for school systems on how to use proxies for race, such as guaranteeing admission to top-performing students from all ZIP codes, according to civil rights activists. In some instances, the Supreme Court says that race can still be used as a factor so long as it is not a determining one. 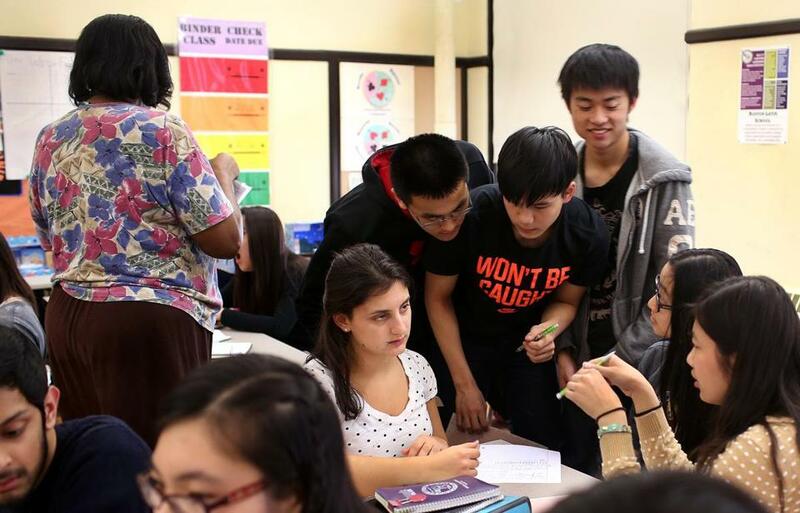 Boston Latin and Latin Academy have been enrolling disproportionately high percentages of white and Asian students when compared with school system averages, while admitting smaller shares of black and Latino students. O’Bryant has disproportionately high rates of Asian students. At Boston Latin School, for instance, 8.5 percent of students are black, and 11.6 percent are Latino. By contrast, 32.4 percent of students districtwide are black, and 41.5 percent are Latino. Beyond potential changes to admissions requirements, Chang said the group is looking at ways to boost academic opportunities for students in elementary schools — such as expanding rigorous courses during the school year and summer — so they can compete more aggressively for exam school admissions. The group will also suggest strategies to publicize the process of applying to exam schools to families who might be unfamiliar with them. The group has been quietly meeting since at least May, poring over reams of data. The group consists largely of civil rights attorneys, civil rights activists, and high-ranking school officials. The committee includes one grammar school teacher, but no designee from any of the exam schools, according to information provided by the School Department. The members are racing to prepare recommendations by the beginning of the upcoming school year, according to a timeline established in a report by the school system’s Equity Office, which urged Chang to create the group. Boston Public Schools Superintendent Tommy Chang. Several civil rights organizations — including the Lawyers’ Committee for Civil Rights and Economic Justice, which has a seat on the committee — wrote Chang a letter in May highlighting various ways the city could change admissions policies to increase student diversity. The potential options include guaranteeing admission to students from every school in the system who perform in the highest quartile at their schools. The organizations also said the courts allow school systems to craft admissions policies that give greater weight to students based on their parents’ level of education, the income level in their neighborhoods, or enrollment at an underperforming school. “All those options promote racial diversity without looking at whether candidate A is white, candidate B is black, or candidate C is Asian,” said Matthew Cregor, who sits on the advisory committee, but was speaking in his capacity as the education project director at the lawyers’ committee. “A lot of what we are going to need to do as a city is make sense of the data and see how the current [admission requirements] succeed or fail,” Cregor added. Civil rights leaders, since writing their letter, say they have felt even more emboldened by a US Supreme Court ruling last month that upheld a University of Texas policy that uses race as one of many factors in admissions decisions to ensure a diverse student body. Cregor said that ruling can have ripple effect into K-12 school admissions policies. Boston is considered to have the nation’s second-strictest admissions policies for exam schools after some New York schools, where decisions are based exclusively on test scores. Boston used to set aside a portion of exam-school seats for minority students. But a US Appeals Court in 1998 found the practice to be unconstitutional after a white student was denied admission and her family sued, prompting the school system to subsequently stop using race as a factor in admissions decisions. Chester E. Finn Jr., a distinguished senior fellow and president emeritus at the Fordham Institute, an education policy center, said that in an ideal world, exam schools should consider a more holistic range of factors, such as essays, recommendations, and interviews, like private colleges do. He says he is no fan of basing admission on test scores. His research has identified 165 of the exam schools across the country, mostly in the Northeast. Few Boston parents reached for comment Thursday were aware the advisory committee had been created or had heard only scant details of it. At least one Latin School parent welcomed a change to the admissions policy, noting that research has indicated a correlation between economic status and performance on standardized tests. “I don’t know why the current method is the be all and end all of fairness,” said Megan Wolf, a member of QUEST, a grass-roots parents organization pushing for educational equity across the city.